1. 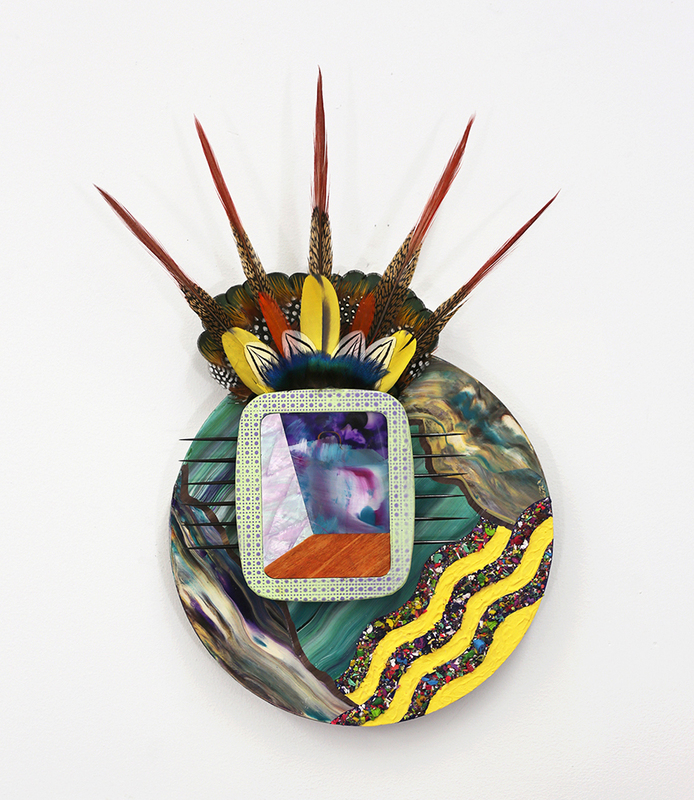 Chan Chan entanglement, 2015, Acrylic, oil, mirror, wood, macaw feathers, 36" x 34"
4. 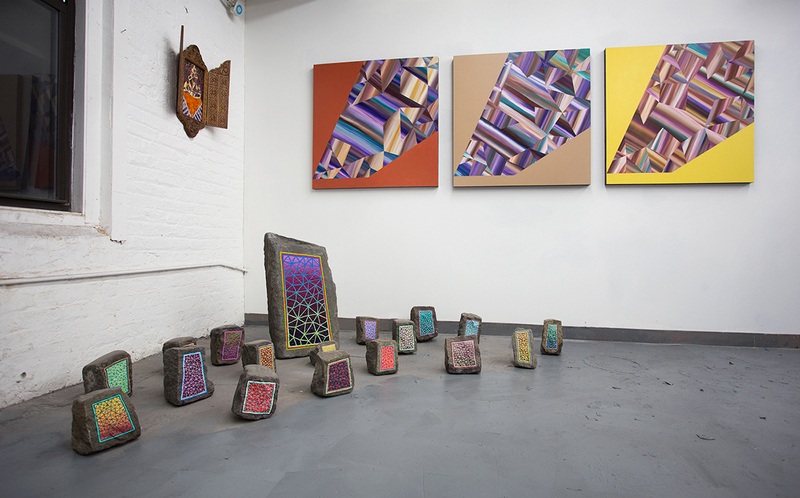 Gila bends, 2015, Oil, acrylic, and veneer on panels 28" x 60"
5. 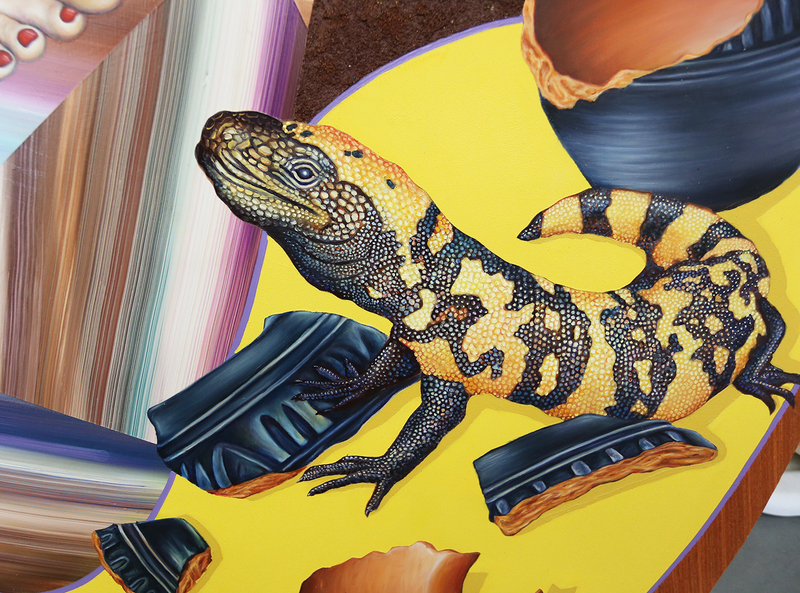 Gila bends, detail, 2015, Oil, acrylic, and veneer on panels 28" x 60"
8. 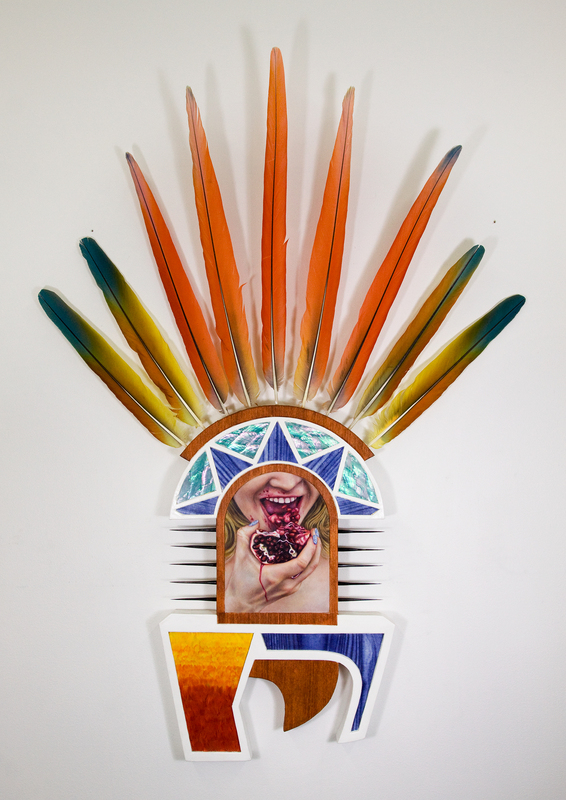 Aztlan overture, 2014, Acrylic, spray, ink, reflec, tive sign material, porcupine quills, feathers (macaw, cockatoo, peacock), and hydrocal on MDF. 20" x 48"
9. 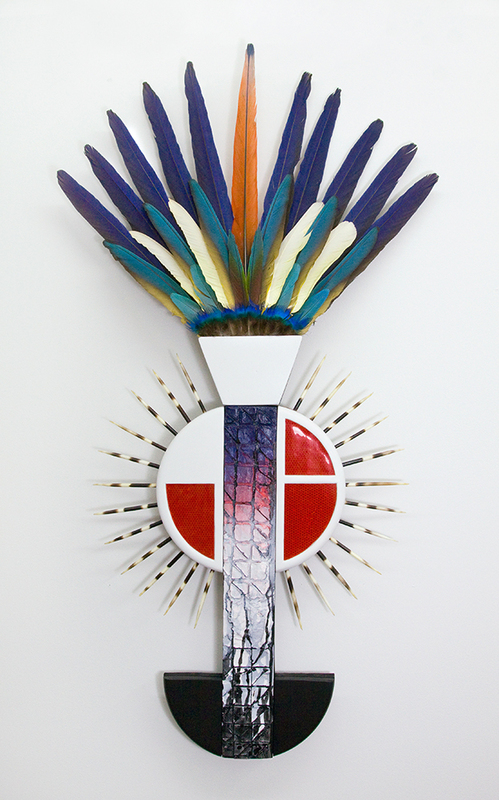 Sonoran visitors, 2014, Hydrocal, acrylic, mother of pearl, macaw feathers on panel. 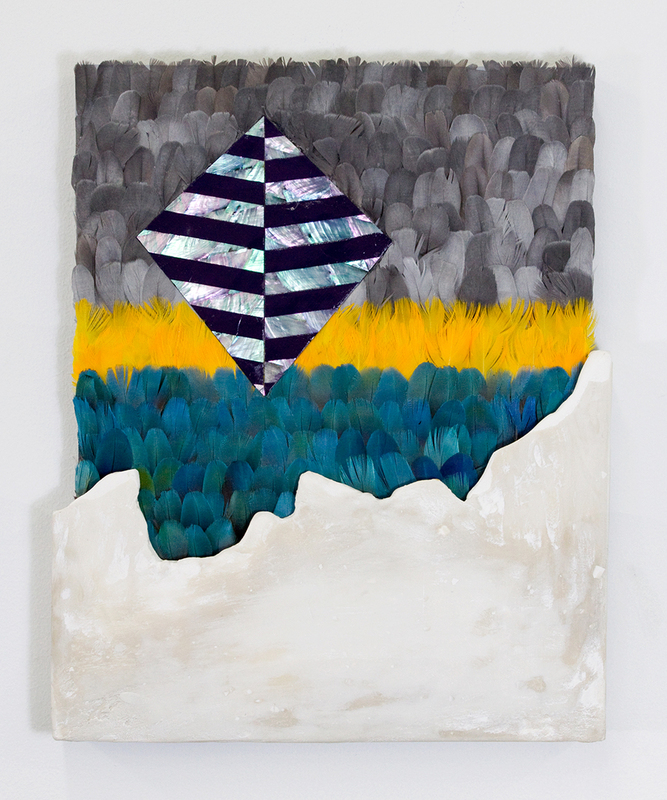 13" x 17"
10.Libertas rex, 2014, Acrylic, crayons, mother of pearl, plastic, wood veneer and mixed natural feathers on panel. 12" x 12"
11. 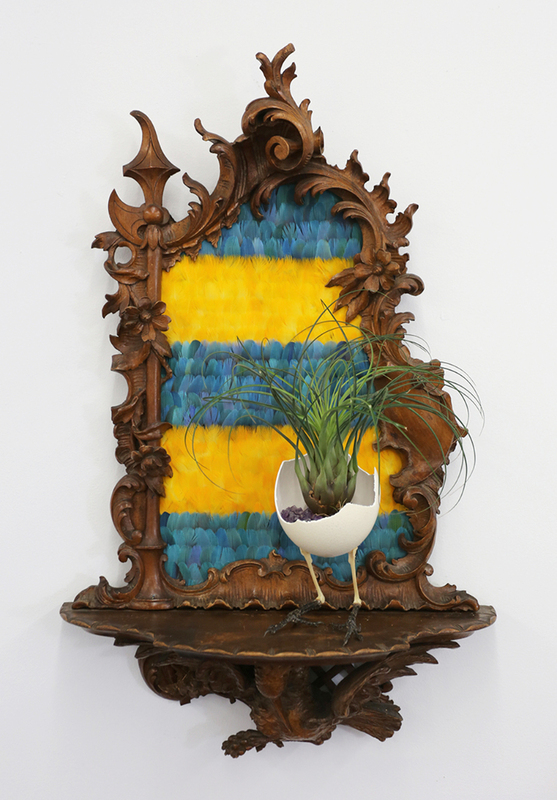 Espejismos, 2014, Macaw feathers, air plant, ostrich egg, amethyst, crow legs on found mirror frame, 24" x 58"
12. 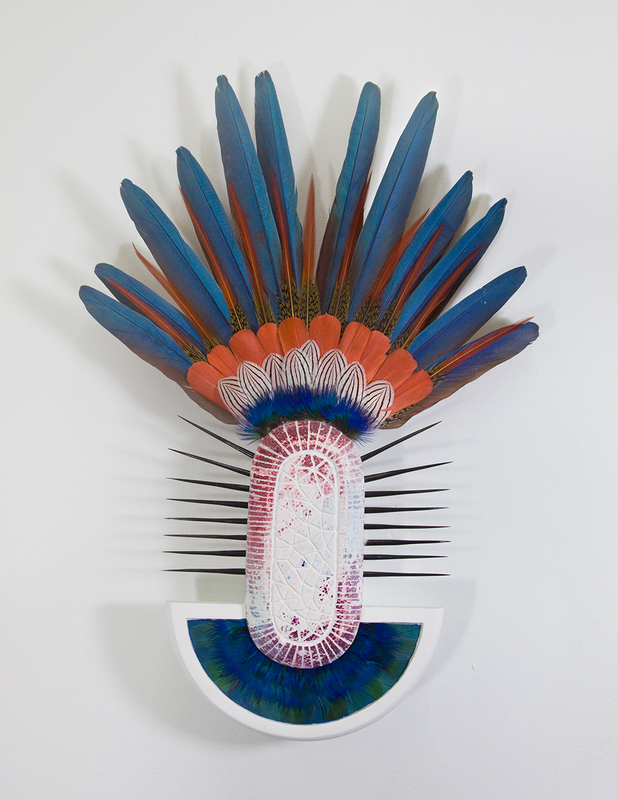 Tlaloc interlude, 2014, Acrylic, feathers (macaw, parrot, peacock), and porcupine quills on carved hydrocal, 20" x 28"
13. 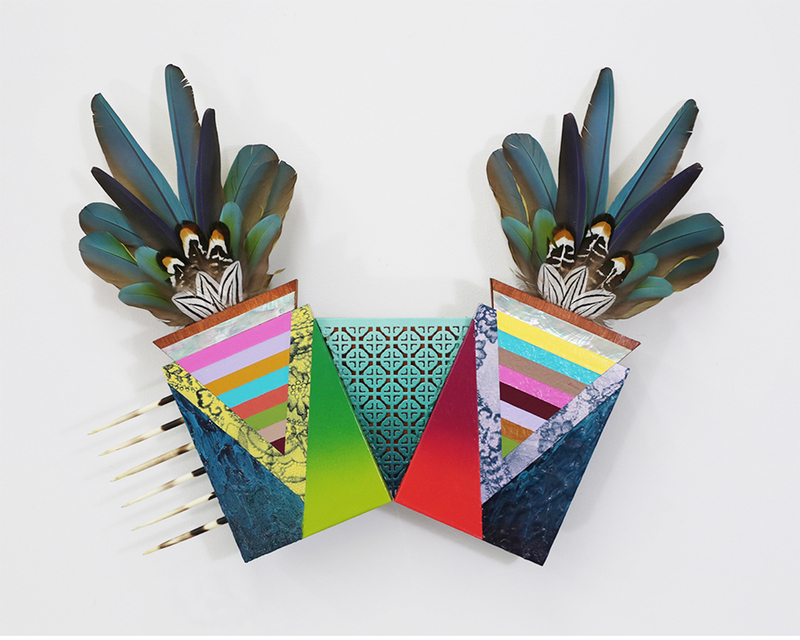 Dos mantras, 2014, Acrylic, gouache, feathers, porcupine quills, metal screen on panels, 24" x18"
15. 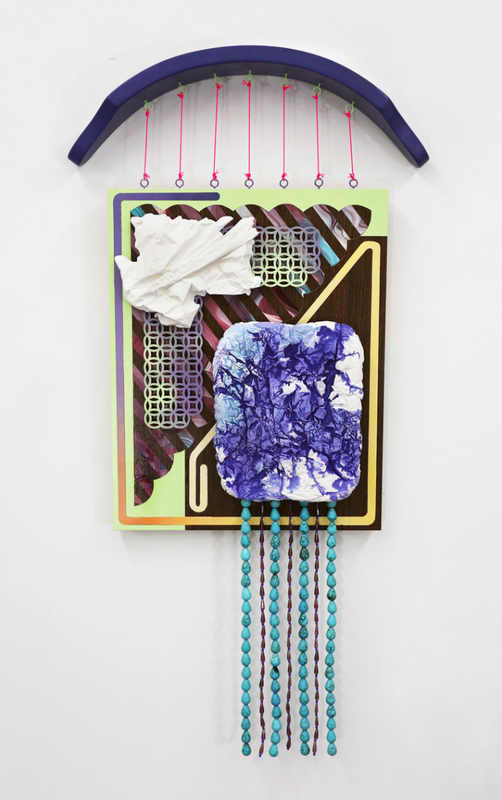 Hacienda Imhotep, 2014, Acrylic, spray, gouache, turquoise, macaw feathers, wood, lace, and metal on panel. 24" x 24"
If life is a vast broth of random acts and tangled reactions, making art is how I chart my way through the soup. My work is about migration and loss. It speaks about the small triumphs of sensual experience, and about the ways that architecture and images can become a part of our emotional understanding. My work is, at its essence, about living in a world that is increasingly homogenous and degraded, but also laden with innovative and interconnected potential. A place where the smallest bits of organic and digital code are defining our future experience. I am interested in humanity’s increasing control and understanding of biological and physical processes, and the ways that technology and nature act as mirrors of each other. My work also reflects a long held interest in both buddhist practice and indigenous Mexican art, and the ways that narrative and meditative craft can conflate to make a poetic experience. Because I was forcefully removed from my homeland and family at a young age, I became accustomed to localizing my identity within a precarious juncture of memory, fact and fiction. My work draws from personal histories of migration and adaptation, and is made with a distinctly poetic methodology. Materials, memories, ideas, and emotions are distilled and reconfigured. These configurations are partly improvisational, and guided by the whims of my subconscious, but they are also exercises in formal and abstract experimentation, and draw upon a love of art history. The eventual goal is to build a language of materials and symbols that provides moments of surprise, humor, and reflection, both for the viewer and for myself. I grew up running around the woods of New England, exploring the endless variety of the natural world, and finding peace in observation. Whenever I’ve felt like a foreigner, nature and art have functioned as avenues of both escape and re-grounding. I work to express the small triumphs and defeats of sensual experience, and I am interested in the ways that architecture and images can become a part of our emotional understanding. My work is, at its essence, about living in a world that is increasingly homogenous and degraded, but also laden with innovative and interconnected potential. A place where the smallest bits of organic and digital code are defining our future experience. I am interested in humanity’s increasing control and understanding of biological and physical processes, and the ways that technology and nature act as mirrors of each other. My work also reflects a long held interest in both buddhist practice and indigenous Mexican art, and the ways that narrative and meditative craft can conflate to make a poetic experience. The flat digital screen has become a new frame for both the restriction and exploration of ideas. The lure of flat screens and images has progressed to the point of ubiquitous iPhone staring, and our lives have largely been compressed into a digital space. From the selfie to the profile page, we are able to constantly manipulate our image. Conversely, outside forces can manipulate an individual’s identity with increasing ease, and the ability of strangers to instantly edit and add their input to our lives is a growing force. In a sense, the entire world has been flattened into a rectangular digital space, and this space, like the canvas, is partly subject to the agencies that control the internet. The ability to create honest, personal, or pure versions of anything is becoming increasingly complicated. Social media platforms and algorithms categorize and calibrate our public image. The digital screen has become a frame for both individual freedom and endless deception. How do we define the basic aspects of our selves and our ideals when our identities are wrapped up in a digital morass? My work is in part a discourse between the layered and graphic flatness of the digital realm and the singular, physical rawness of individual experience. The conversation between our public face and our fleshy reality. 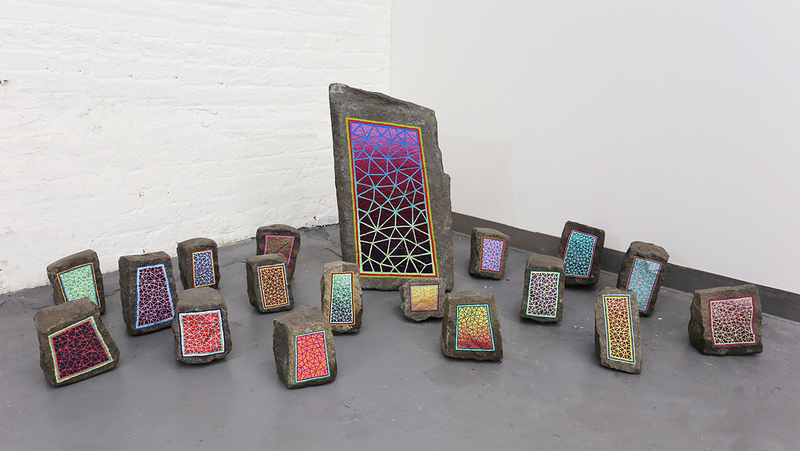 My work appears totemic and iconic, but also grows from the flexibility of modern identity. Like the tribal artisans of the pagan world, we continue to tell our stories and identify our people through the materials that we choose and collect. I embrace the material connections of the natural world, but also revel in the playful liberty of the mash-up and computer collage. “Trash” materials engage with precious ones, and like a mischievous greek goddess, paint makes appearances throughout- catalyzing both tension and balance. Stereotype, gender roles, and ethnically derived identity are challenged using a subtle manipulation of medium and symbols. Like search engine tabs or endless instagram feeds, painted surfaces can contain layers of history and experience. The breaking of structural boundaries and material expectations imbues the pieces with a singular presence. I like to play with the tense balance between the way that we use objects to define us, and the ways that these same objects take on a transformative power of their own. Using the practice of painting as a starting point, I try to craft moments of intention, symbolic power, individuality, and personal struggle from sources that are endlessly impure. What is the role of the tribal, the communal, and the artisanal in a society where the click of a button can connect you to the rest of the world, and global media conglomerates dictate the styles and cultural norms of millions? My stylistic influences are wide, from the perspective and mood in Japanese ukiyo-e printing, to the direct and tragic-comic nature of mariachi ballads and Mexican folklore, to the confrontation of indigenous, European, and even Tibetan Buddhist spiritual symbology. 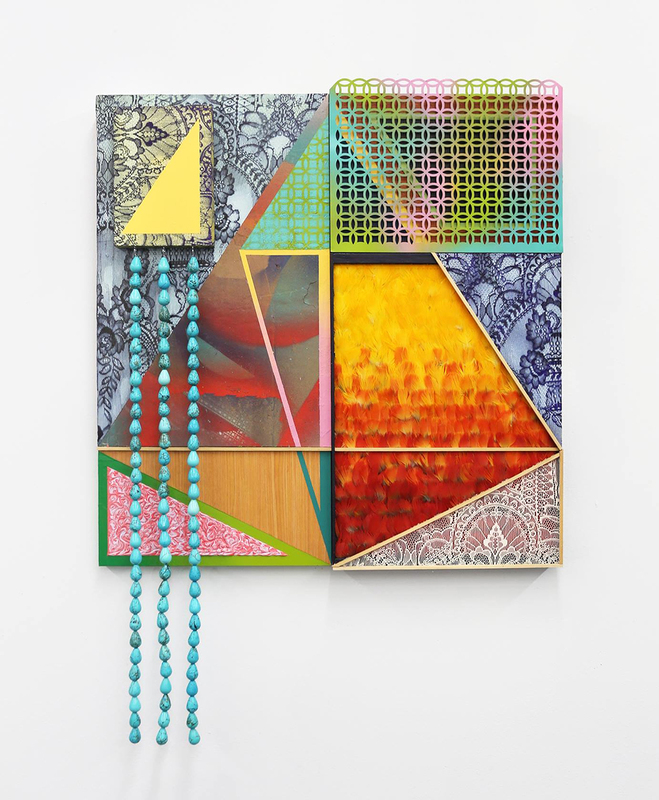 These all form a backbone that supports forays into new methods of working with abstraction and iconography. Much like the internet, my work forces the viewer to examine what is exotic and what is commonplace, as well as what is authentic and what is fabricated. 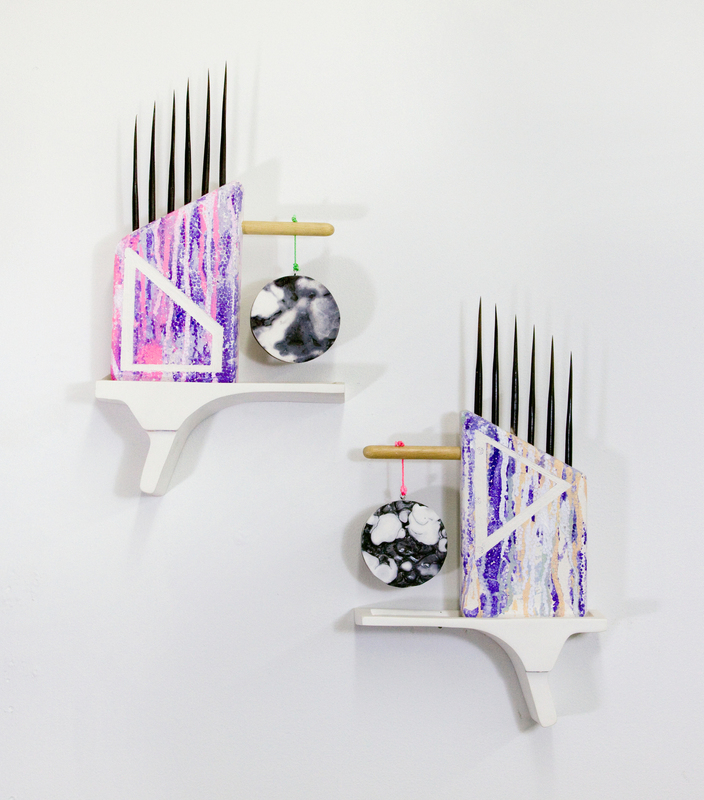 Feathers act as brushstrokes, found objects become molds for painted sculptural elements, and paint is used in a way that both references as well as questions the history of the medium as a form of communication. I am interested in the ways that these materials engage the viewer’s understanding of history, progress, and time. For example, the feathers or stones used in the work may seem the most natural, but if we dig deeper, we can remember that the acrylic and rubber in the pieces are derived from petroleum products, which in turn came from decomposed organic materials like dinosaur bones. At its essence, my work is a reaffirmation that reality and life are nothing but what we make of them. Liberties Dorsky Projects, LIC, NY. 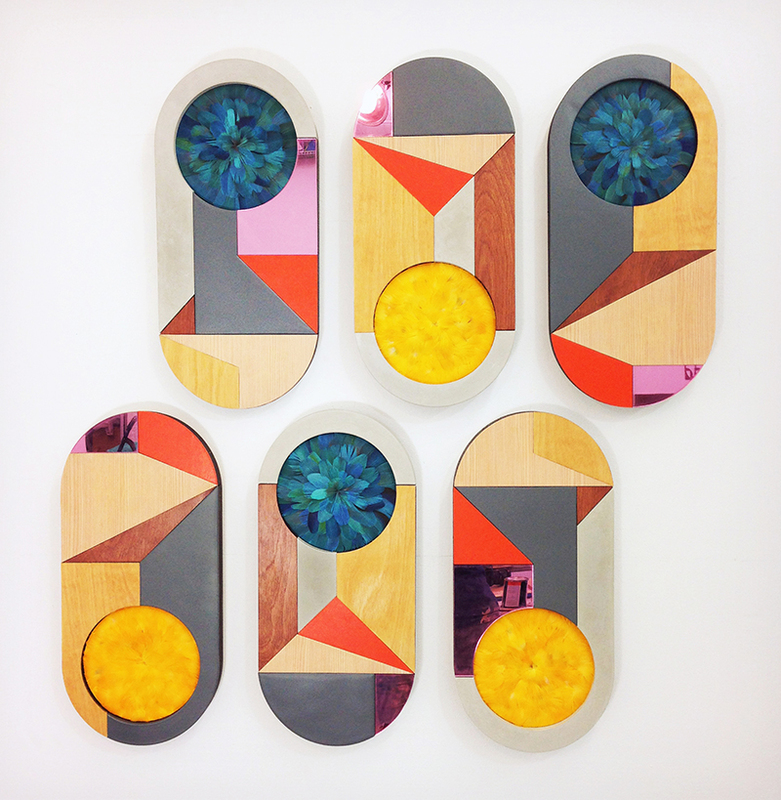 Curated by Eileen Jeng. NurtureArt Annual Benefit 2014, The Boiler, BK. Arts in Bushwick Annual Benefit, Storefront Ten Eyck , BK. “Ciudad Saudade” Reverse Space, Brooklyn NY. Annual small works show, Ulla Surland Gallery, Fairfield CT.
Gallery artists group show, Drift gallery, Kittery ME. “Love – in the eye of the beholder” Westport Arts Center, Westport CT.
“Sources-Origins” Bradford gallery, juried by Howard Yezerski, Cohasset MA. “Re-envisioning landscape” Hounds of Love Gallery, Providence RI. Westport Arts Center, members group show, 2009- Received First Prize.